This is a simple recipe to bake for breakfast or a simple dessert. I kept the ingredient list very open ended because it really matters on your preference of sweetness and how many apple you have on hand. You can serve it with raw cream or blend it into a nice rich “apple butter puree”. Why should you eat Molasses? The other day my mom was craving molasses, I could not help it- I HAD to know why. I found out some cool facts. Let me share. I found a spoon full goes along way and is a nutritional powerhouse! -High in manganese “helps support thyroid and keep blood sugar levels even”. Dont just stop by making these yummy apples (or pears- do you see the 2 hidden pears in the corner?”). I used what was left over from dessert to blend in the blender or you can use a food processor too. 1. Apples can be warm or cool. 2. Place apples and all juices in the blender. 3. turn on high until a nice smooth consistency -you can leave a little chunky if you like. *some people in my family like the “apple butter puree” better then normal apple sauce (learn how to make it here) because it does not give them a sugar crash, and instead the fat helps them absorb the sugars a lot slower. Plus it is a lot more nutrient dense. organic apples or pears (I used 6 total) -make sure the fruit is organic because apples can be high in pesticides. If you cannot get organic, then peel them first. organic honey or organic maple syrup (2 Tbsp) – feel free to use vanilla honey too! 1. Wash the fruit and cut in 1/2. Core the seeds out by making a “v” shaped wedge. 2. Lay the fruit face down in a pyrex oven safe dish. 3. Spread the softened butter on each piece of fruit. 4. Drizzle the honey and molasses over. 5. Sprinkle on cinnamon and salt. 7. Place in oven for 30 minutes about. That looks wonderfully yummy. 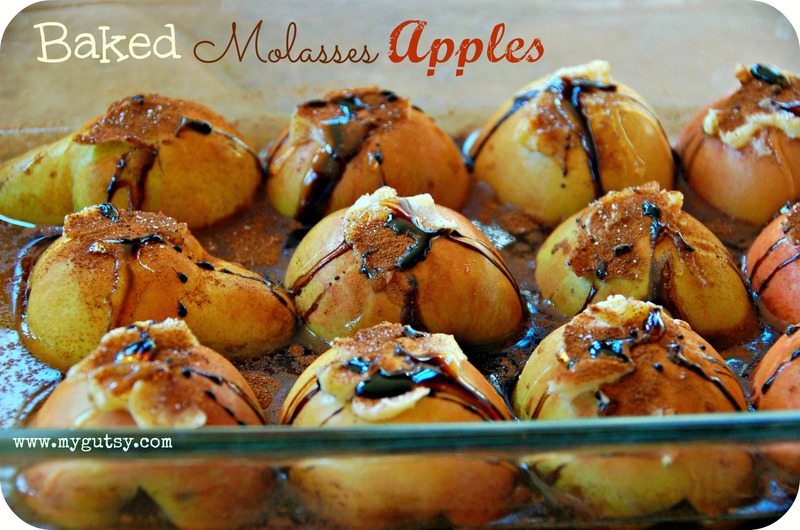 I love molasses and I actually have a few apples I was trying to think of something to do with. Thank you for the post. Molasses, as far as I know, is not GAPS-legal. Am I wrong? You are right, it is not legal..but a few of my recipes are not GAPS friendly. It is optional though so just take it out if you are on GAPS.